Expert literature has a lot of dilemmas regarding building of Medvedgrad, but it is certain that the burg was completed in 1254. The initiative for construction gave pope Inocent IV, and in those times Kaptol’s Bishop was Filip, king’s confident and great constructor. 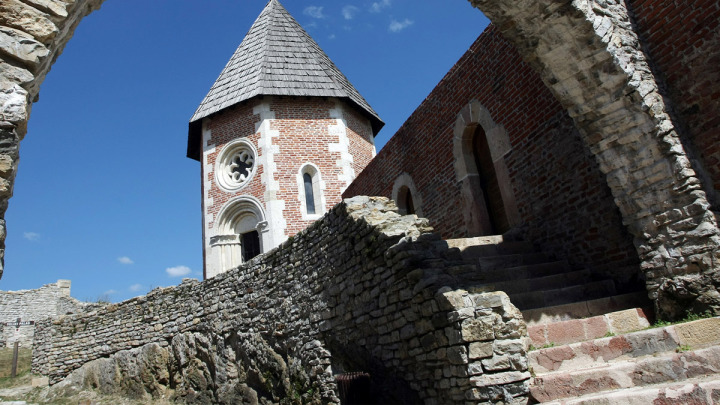 Although it was royally decorated, and strongly fortified – with double defensive walls, armor, defender towers, cistern, and chapel – Medvedgrad was never king’s sanctuary, and has never been under siege. It is considered that the most valued building is an octagonal St. Filip and Jakov chapel with stone corners, rosettes, and Romanic portal 3 m high. It had many masters: from Croat – Hungarian kings and Zagreb ‘s Bishops, to noblemen and canons. Those were: duke Koloman, Babonić’s, governor Mikac, King Žigmund, Bishop Eberhard, Celjski counts, King Matija Korvin, duke Ivaniš Korvin, Juraj Branderbuški, Nikola Zrinski, and the last masters were Gregorijan’s. Estate – owners lived of the estate at the foot of Medvednica (Šestine, Blizna, Dedići etc.). Gregorijan’s, as last tenants but not owners, as well, abandoned Medvedgrad and moved into a newly built manor in Šestine just before the earthquake 1590. Medvedgrad has never been renovated after that because new social conditions reduced its strategic importance, but also because culture of living changed. New ways of constructing, stiles in architecture, and demands regarding the comfort of living made living in Medvedgrad unnecessary and uncomfortable, and its renovation unjustifiable. In 1974 began exploration and conservation of walls, and reconstruction of certain parts. Within Medvedgrad there is a sculpture of academy sculptor Kuzma Kovačić – The homeland’s altar.